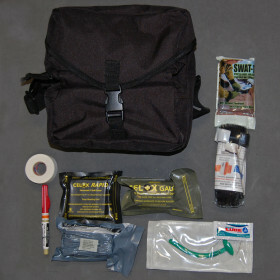 Tactical Team Trauma Kit » Protective Solutions, Inc.
Be prepared for multiple critical injuries! Designed for the professional tactical team's worst case scenario. Includes battlefield proven trauma gauze, hemostatic gauze, tourniquets, decompression needle, chest seals and more all packed in a 3-compartment military grade kit that makes everything easily accessible. Image shows kit and some of the items included. We can create custom kits to accommodate special needs, contact us for details. Gauze Pack containing 1 - 5" x 9", 2 - 4" x 4", 2 - 3" x 3"
Custom refills available, contact us for details.